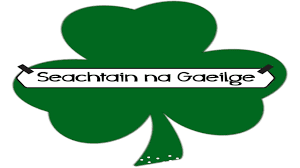 This year for Seachtain na Gaeilge we ran various events throughout the school. With the help of our TYB students we facilitated quizes with the second and fifth years, which the TY students developed themselves in Irish class in the lead up to it. We also organised a Céilí for all TY students to participate in which they enjoyed immensely. Our visiting students got the opportunity to taste of our traditions. All first year students were involved in a poster competition which were based around seanfhocail’s and the Art department also got involved with some wonderful art pieces around Irish being submitted. To include the whole school we made announcements each day and had a Seanfhocal an Lae (Proverb of the day) which were displayed on the Irish noticeboard. We also kept the student entertained throughout the week by posting Irish memes around the school. The week was a great success with students really enjoying the various activities organised throughout the week. We are already looking forward to next year! Tír gan teanga, tír gan anam!